Collaborative Artists Ensemble is Proud to Present the West Coast premiere of this intriguing play by Elena Hartwell. 2013 Marks our 6th Season of Plays! 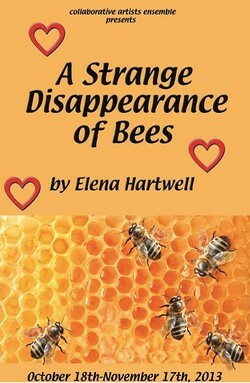 A Strange Disappearance of Bees take the audience through a honeycomb of relationship and revelations as five characters (a Beekeeper, a baker, a Vietnam Vet, a farmer and a stranger to town) search for identity while bees disappear around them.